I read this article and found it very interesting, thought it might be something for you. The article is called September 2014 – Monthly Income Report and is located at http://www.onehourprofessor.com/september-2014-monthly-income-report/. I’m extremely excited to deliver it to you. Moving forward, I’m going to write a very detailed income report each month which outlines the money I made (or lost) and the time I spent working. One thing that I think is important to note is that I actually began keeping track of my time on September 18th. The reason for this is because I didn’t even think of the idea until then. Realistically there should be another six or seven hours added to my total time worked this month because I created a video quick tip which explains how websites make money. However, I created this video before September 18th so it isn’t included on this report. Below is everything that I did this month, if you didn’t get a chance to view the content, I highly recommend taking a look because I have gotten a ton of good feedback. VIDEO QUICKTIP: How does PPC advertising work? If you’re wondering how I tracked my time, below is an explanation. First, I downloaded an app on my iPhone called ATracker. From there, all that I needed to do was create a specific task that I’m working on and then it’s as simple as clicking on that particular task in my iPhone to start a timer. Each task that I have has a timer allotted to it. Every time that I click on the task in the app, it starts a timer that I can click again to stop. At the end of the month, I’m able to export all of the time worked on all my tasks through an Excel sheet that I can manipulate however I’d like. Also if you’re wondering, yes, I’m purposely rounding off these numbers to the nearest hour. I am doing this because I don’t see a need to make this report that detailed. Truthfully, that’s about all I have to say about my first income report. I did the math behind this and figured out that I’m actually paying $2.18 per hour to work on this website. Forget about the opportunity cost of how I am missing out on other things, this month I lost a total of $144.09. This alone would be enough to scare away most people, but I actually feel very positive about this month. As mentioned in my recent blog post, I was able to make $9.80 from one of my affiliates and that gave me proof of concept about what I’m trying to do. The reality behind most businesses is that they aren’t going to turn a profit for at least the first year. Although I’m hoping that this isn’t the case for my website, I understand that if someone wants to be successful they have to be very patient and continue to grind in order to reach their goals. I’m not going to lie, this month is already testing my determination. It’s tough to put in 68 hours of your free time only to look at a loss at the end of the month. However, I’m confident that this trend is going to eventually turn around, but I don’t know exactly when that’s going to be. Below is a table showing my income and expenses for the month. Based on what my analytics tell me, one of the most difficult things that people struggle with when creating a website is finding website images. Knowing this, I did two things to try to help my audience out. First, I hired someone through Elance to collect 433 website images that are of public domain to offer to anyone who creates a free account on my website. Because these images are of public domain, they don’t require attribution and you can use them freely however you’d like. Second, I decided to partner with a company named Shutterstock. This is a company that I’ve used when trying to find quality website images. Truthfully, it’s easy to find images on the Internet, but many people don’t realize that you can’t just copy an image from Google and use it on your own website. Images have copyrights too and if you infringe on those copyrights, you can be subject to a very large fine or possibly a lawsuit. I’ve written a few articles about this topic, and somewhere along the way somebody trusted my recommendation (Thank you!) for Shutterstock and purchased a photo. My other source of income this month is from Aweber. I really can’t say enough good things about the service as it has some pretty awesome functionality for email marketing. Most people may be asking themselves why I’m so focused on email marketing. What if I told you that according to a Mckinsey study, email marketing is 40 times more effective than social media? If you think about it, this makes perfect sense. When we are on social media channels there is a very small percentage of people who are going to see any of our posts. However, when you send an email to someone they either have to read email, or just leave the email unread. If you’re anything like me, and unread email is an absolute travesty and must be eradicated immediately. Therefore, I feel that many people tend to take some type of action on their emails which results in them making a decision to read what I’ve created, or deleted. Either way, at least it gets noticed. The $5.70 I made is reoccurring from someone who decided that Aweber was the email platform that they’d like to use. To whoever that was, thanks a bunch! I suppose the old saying, “It takes money, to make money” really holds true in this month’s income report. However, please realize that you don’t have to spend the amount of money that I am to get your own website created. The reason that I spend the amount of money that I do on my website is because I have limited time and want to accelerate the how quickly things get done by using different tools. There are many people that just create a blog, write because they enjoy writing, and then eventually figure out a way to monetize. If you’re looking for that type of approach, I created a video quick tip a while ago that explains how you can build a blog in under five minutes for $15. After you have the blog built, you would want to make sure that you have Google analytics installed and then just write your heart out. In terms of the expenses, Aweber, Buffer, and Long Tail Pro are going to be fixed expenses from month-to-month. As mentioned previously in the report, I spent a little bit of money on Elance to get 433 public domain images as a perk for individuals who create an account on my website. These images can be used on your own website freely without giving me any attribution, so feel free to take them from me! I did a little bit of an experiment this month and tried some advertising on YouTube which, honestly, was a total failure. I got a lot of views on my video, but there weren’t many people who visited my website because of it and it didn’t end up returning on its investment. I have plans on writing an article about the whole thing sometime this month, but I’m not sure exactly when yet. You can also see that I spent $45.80 on Hostgator. This is because I purchased a few domains that are going to be my niche websites and I’m also the proud owner of www.RonStefanski.com. If you click on that link you’ll see that I’ve done nothing with the domain yet and I really don’t know what I’ll do, but it’s always a good idea to purchase your own name as a domain. The last experiment that I did this month which only cost me $.05 is using the Outbrain content platform. I found out about this tool at a previous employer and think it’s a pretty neat service. Simply put, Outbrain lets you get traffic to your website for very small amounts of money. I’m talking getting people to see your website for $.03 per click. Now, I’m still in the beginning stages of figuring out how to best use Outbrain and will eventually write a blog post about this, but it’s definitely an interesting platform in terms of getting traffic. Finish the Internet Marketing 101 course redesign that is only available to those that create an account on my website. Well folks, that’s it. Hopefully you enjoyed this month’s income report. This month was a little tough, if you feel like making my day please comment below with your well wishes. You have no idea what this means at this point considering all I’m doing is spending a ton of my time on the website with very little profit. Thanks! great post!! 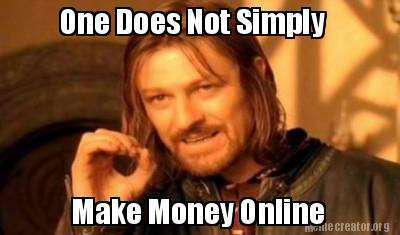 you are absolutely right, internet is filled with scams especially in make money online category. i’ve been trying to learn for the past 2 years and now when i know quite a bit about the subject i realize how much time i have wasted on useless information out there on the internet. anyways, I hope your project starts earning soon. gud luck!! Thank you so much, John! I have seen a TON of those scams and am trying so hard to convey to people that this isn’t like all of those other websites. Hi Ron! Found you through LWB (comments section). I just published my first income report this month too; it’s a little different from yours, as I’m a freelance writer, but I believe it’ll be a great thing for both of us! If you want to read it’s at: http://horkeyhandbook.com/september-income-report-freelance-writingva-work/. Nice to meet you! Hello again Ron! Great post. What are you using to make the tables in this post? It’s nice and clean and the clickable links are awesome. Also, great idea to keep track of your time. I will start including this also in my monthly reports. The time thing is difficult to manage, but definitely nice if you can figure out a good system to track everything. Thanks Ron for your share & transparency. Start-up costs & time are usually in the red but if it’s where your heart is, it will be a winner. BTW have you read Tim Ferriss’s 4 Hour Work Week? I just finished & while some aspects need a medium grain of salt, the overall premise is very encouraging & would highly recommend a read. I thought of you at one point and how you quit school to pursue your own business. Tim talks about the ‘why’ (motivation) to do the things we strive for. Thank you for the encouraging words! I have read 4 hour work week three times, haha. It really is a good read and actually got me into creating my first website ever. I definitely recommend it to anyone looking to start on this sort of thing. I guess the biggest thing though is just being consistent and hard working. It’ll pay off eventually! I dont see a “loss” on your income report. Instead I see someone that is out there making things happen and will in short time be rewarded for their efforts. You have separated yourself from 98% of the population just by taking action. Just stick with it and you will see the rewards coming soon. Would be interested in how you go into outbrain and your experience with it. Thank you, Jennifer! I will keep on pushing for sure, hopefully it will keep growing. For me, Outbrain has been ridiculously simple. I just input my RSS feed and when I publish a post, it aggregates there and gets people to come to my website. I have the max cost for each click set at $.03 and usually get 5-10 visitors a day. I don’t know that I would say that the traffic is the highest quality, but some of them have drilled down pretty far in the website and I even had some email signups. I’ve looked at Outbrain before, and wondering what content they take. My interest in this is for a digital media broadcasting project I’m due to launch in the coming months. It will also have an active blog with weekly content publishing. Putting my 11yrs in broadcasting, and experience as an online editor to good work. Thanks for chiming in! Personally, I think Outbrain will take just about anything that isn’t adult themed because all they do is fill remnant space. If I were you, I would just sign up and plug your RSS feed in there and see what happens. Again, I haven’t seen great engagement or many people signing up from my Outbrain traffic, but when you pay $0.03 per click it might be worth it just for more exposure. Eventually I want to do a blog post that talks about penny traffic opportunities….keep an eye out. Thanks Ron. Sounds like a good idea. If the pricing is right, it could be a great traffic driver. This is amazing you have brought a glimpse of reality to many that the more you do through the challenge is the more you become. That is an investment i have not seen any loss. Thanks for chiming in! And yes, things have come a LONG way since this first one, but it goes to show that it is possible! I loved this post Ron. I’ve been trying to do my own thing and can totally relate to this post. While I am in a new place now, it isn’t much further. Look forward to reading all your income reports to help me formulate my own plan and success!